RUST Updates Schedule, when is the next RUST update? When is the next RUST update? When’s the server patch releasing? When do RUST updates happen? When do I need to update my RUST server? When is the next server wipe? When is the next blueprint wipe? When is the next map wipe? Will the server I play on be wiped? When is the server going to be updated? Do I have to manually update my RUST server? 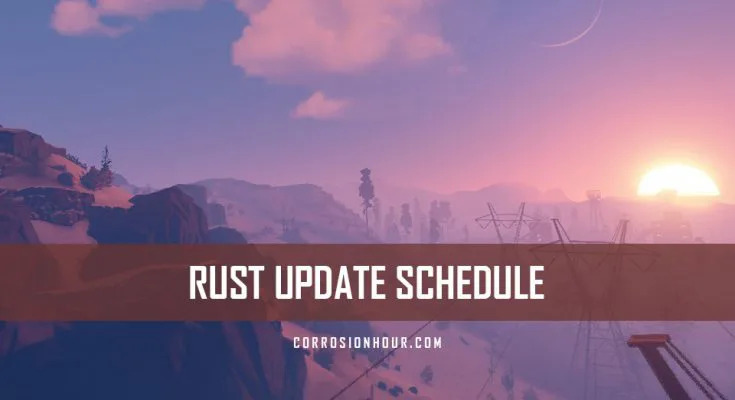 RUST updates, as of February 2018, are now released on a monthly schedule by Facepunch Studios. The primary target for each new rust update is targeted for the first Thursday of the month. A server update is released first, then is shortly followed by a client update. The client update should automatically appear in the Steam “Downloads” section as soon as it’s available. Exit and restart steam if it does not appear for you. The release time of both updates varies. They have historically been made available around 7:00 – 9:00 PM UTC. This is not an “official schedule”, but this pattern has been going on for many years now. According to Playrust’s Information section, this is still true. To follow the RUST update status, keep an eye out on the Official RUST Blog for the latest developer update and blog post. Every now and then, updates can also trigger an emergency downtime, with a follow-up patch or patches shortly after. If critical bugs are discovered and reported by players, servers may have to be wiped. The monthly RUST update is required for all servers, whether they’re Official Servers, Community Servers or Modded Servers. This also means the RUST client updates are also required to be downloaded by the players who play on those servers. RUST updates require server admins to update their servers with the latest version of RUST. When Facepunch releases the server updates, all servers will need to be brought down (on their own schedules) for a short period of time to download and patch the latest release. This typically takes anywhere from 5-15 minutes depending on settings and configurations. Servers with mods can tend to break on new releases and require additional time for updates to the respective uMod (oxide) plugins. Before players are able to play on a freshly patched server, the player will also need to download the latest “client update” or “client release.” As mentioned before, client updates are released shortly after the server update. This process will happen at least once a month. Increase the performance of the server – Over time, the entity count on the server builds up to an unsustainable level and consuming more memory than is available. To give new and existing players a fresh start – A large portion of the RUST player base enjoy these wipes, but it can be aggravating for others to see their work wiped away. Corrosion Hour, for instance, does not wipe on these weekly updates, but it is required to update to the latest stable version of RUST. If you’re looking for this information, try talking to your server’s admins or look for their website. Every server operates on their own particular schedule and these questions are very common. What are forced wipes and when do they happen? On the first Thursday of every month, assuming all necessary changes have made it into the next release, RUST servers will be “forced” to wipe their databases in order to upgrade to the latest version. This necessary database dump is required in order for the server to update to the latest version of the game. How do you know when an update was released? The RUST team has been very consistent keeping their players updated on the status of the latest patch via their website and through their twitter. Each new update is typically preceded by a community blog post and then followed post-release, with a developer blog that provides more detailed information around the changes. Usually the server update will be released first, then followed shortly after with the client side release, that will trigger the auto-update download in Steam. Often, there is a window of time between these two events happening. When a server has updated to the latest version of RUST, if your client side game has not patched up before attempting to connect, you will encounter a client mismatch error that will prevent you from connecting. This error means that you and the game server are out of sync with each other. It’s not uncommon for a server to not be fully patched up on release days, so if its disappears from your server listings, it’s likely because that server has gone offline. However, if you see the server and attempt to connect but its not allowing you, it’s likely due to the client mismatch error. On the player (client side), you will receive an error message on your screen. On the administrative side, in the server console or logs, you will see the player’s name, steam id, error code, and kick reason. However, for most players, Steam should auto-download any new updates automatically, unless your configurations are set to not do so or you’ve encountered a bug in the update system. There are many reports of players that have to run a file verification over their RUST files in Steam in order to trigger the appropriate update. Why are there so many updates in RUST? The RUST Experimental survival PC game, while still in active development, is currently available for purchase through Steam. Having started as an Early Access Game, RUST continues to require community feedback with each update. Feedback can be provided in numerous ways, but the primary method can be easily accessed through the in-game bug reporting system. There’s also the Official RUST forums, Steam Forums, and the vibrant /r/playrust community. Throughout the history of RUST development, it remains to be heavily influenced by its player base, but an Official RUST Roadmap is available to give players some visibility into the direction the developers are navigating the game’s development.